Cynthia Anne "Cyndi" Palmer - age 53, of Berwick, passed away suddenly and unexpectedly on Thursday, February 7, 2019. Born in Halifax, she was a daughter of George and Velda (Hawes) LeFrank of Malagash, Nova Scotia. Cyndi dedicated her life to her family and community. She loved working with children as she did for many years in the Berwick and Somerset schools. She was a member and past president of the Berwick Volunteer Fire Department Ladies Auxiliary, member and past president of the Berwick School Band Parent Association, served as a 4-H leader and was a past president of the Berwick Gala Day’s committee. 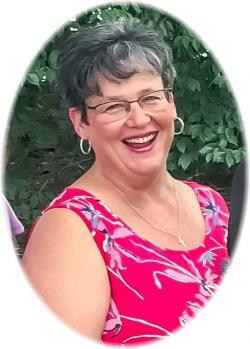 She was a faithful and dedicated member of the Roman Catholic Church and was currently serving as Parish Administrator of the Annapolis Valley Catholic Churches at St. Joseph’s Roman Catholic Church, Kentville. In addition to her parents, she is survived by her husband of 34 years, Stephen; children, Samantha (Lisa) Palmer, Calgary; Nicole (Calum) MacQuarrie, Calgary; Jacqueline (Adam) Ernst, Grand Falls, Newfoundland; Gregory Palmer, Ottawa; Christina Palmer (Branden Cotter), Berwick; siblings, Cara Munroe, Eastern Passage; Colette (Stephen) Cleary, Cole Harbour; Pierre LeFrank, Dartmouth; grandchildren, Isla and Barrett Palmer, Calgary; father-in-law, Alton Palmer, Millville; nieces, nephews, extended family and the many children who grew up in her home who she loved dearly. She was predeceased by her mother-in-law, Darlene Palmer and brother-in-law, Lloyd Munroe. Visitation will be held from 6-8 p.m. on Sunday, February 10, 2019 in the White Family Funeral Home, Kentville. The funeral mass and reception will be held at 12:00 p.m. on Monday, February 11, 2019 in the St. Joseph’s Roman Catholic Church, Kentville, Father John MacPherson officiating. Following the reception, burial will take place in the Berwick Cemetery. Donations in memory may be made to the Somerset School Nutrition Program or to a charity of your choice. Funeral arrangements have been entrusted to the White Family Funeral Home and Cremation Services, Kentville.